BigSemantics is an open source software architecture for developing powerful new interaction paradigms and other applications based on supporting metadata semantics from diverse information sources. BigSemantics includes the meta-metadata language (including inheritance mechanisms and code generators), a repository of meta-metadata wrappers, the BigSemantics service, and a powerful runtime library for clients and servers. 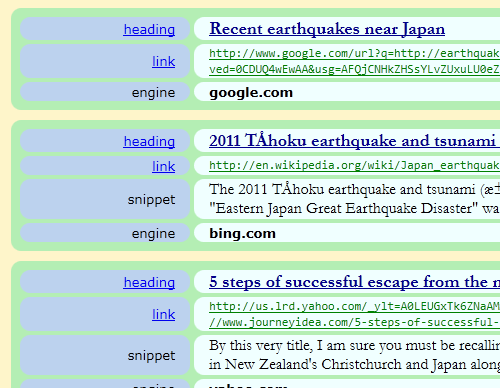 Wrappers are authored in the meta-metadata language to support a life cycle of metadata semantics for curation, information-based ideation, and other tasks. This metadata life cycle includes acquisition, presentation, manipulation (by humans and programs), storage, and transmission. 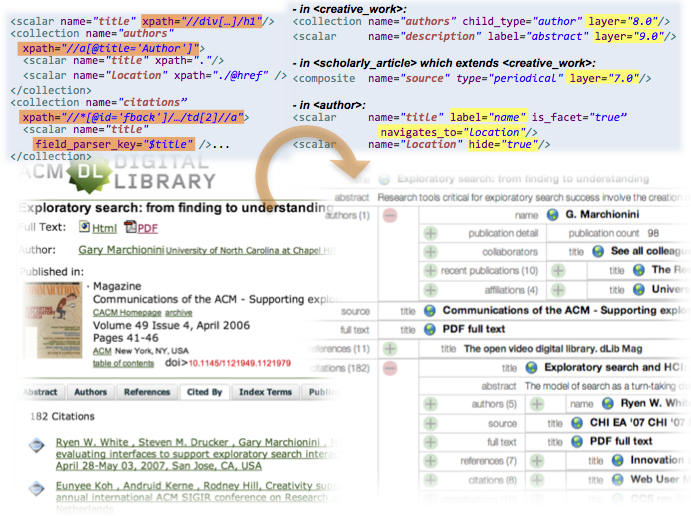 Meta-metadata wrappers specify: (1) data models for the corresponding metadata, (2) rules for extracting metadata from particular information sources, (3) operations on metadata, and (4) presentation guidelines, including semantic zooming. We define an information source as a type of document, differentiated from others by template-driven structure, published by a web site or digital library, and functionally accessed by URL pattern, MIME type, or other selector. These meta-metadata wrappers serve as an abstraction layer between the information sources and users, supporting information curation and interaction applications, such as IdeaMÂCHÉ, Metadata In-Context Expander (MICE), and TweetBubble, for desktop, pen+touch, and mobile devices. BigSemantics comes with a large yet growing repository of wrappers, supporting a wide range of information sources, including weather forecasts, Google Books, Amazon Products, games, movies, blog posts, RSS, and so on. You are welcomed to contribute to the wrapper repository! See "getting involved" for more information. Check out the BigSemantics wiki at github for further introductions, scenarios, and instructions on getting started. Set up a development environment, and perform the tutorials to get your feet wet. 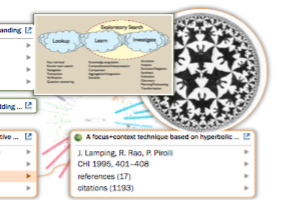 Kerne, A., Damaraju, S., Kumar, B., and Webb, A. Meta-Metadata: A Semantic Architecture for Multimedia Metadata Definition, Extraction, and Presentation, Poster and Demo Proceedings of the 3rd International Conference on Semantic and Digital Media Technologies.